The decision to conduct the AMSA followed the release in 2004 of two relevant Arctic Council reports. First, the Arctic Climate Impact Assessment (ACIA) was a major study that received global attention and reported on the rapid and severe climate change ongoing in the Arctic. One of the key findings of the ACIA was that “reduced sea ice is very likely to increase marine transport and access to resources.” The second report, the Arctic Marine Strategic Plan (AMSP), presented the council’s strategic goals for protecting the Arctic marine environment. The AMSP called for future application of an ecosystems approach to the Arctic Ocean and for a comprehensive assessment of Arctic marine shipping. The AMSA is designed to be circumpolar in breadth and also to consider regional and local perspectives. The assessment’s central focus is on ships: their uses of the Arctic Ocean, their potential impacts on humans and the Arctic marine environment and their marine infrastructure requirements. The AMSA does not place a primary focus on determining the operational and economic viabilities of specific marine routes within and across the Arctic Ocean. The AMSA, led by Canada, Finland and the United States, reached out to a broad community, including the global maritime community consisting of shipping companies, ship designers, shipbuilders, ship classification societies, marine insurers, non-commercial partnerships and shipping associations. With the support of the Permanent Participants (indigenous organizations) of the Arctic Council, town hall meetings were held in selected Arctic communities in Canada, Iceland, Norway and the United States to listen to issues and concerns about future Arctic marine activity. The AMSA linked directly with experts of PAME for marine environmental protection issues and overall guidance and leadership of the AMSA. Two additional Arctic Council working groups were also consulted: the Emergency Prevention, Preparedness and Response (EPPR) working group on spill response and marine infrastructure requirements; and the Sustainable Development Working Group (SDWG) on issues related to the human dimension. All ship types are considered in the AMSA under the general topic of Arctic shipping: tankers, bulk carriers, offshore supply vessels, passenger ships, tug/barge combinations, fishing vessels, ferries, research vessels and government and commercial icebreakers. The result of the AMSA data survey effort produced a comprehensive estimate of how many ships (less naval vessels) operated in the Arctic for a given year. This survey represents an historic capture of information from the Arctic states that can be used as a long-term database against which to measure future Arctic marine traffic levels. In addition, more than 185 experts participated directly in the work of the AMSA. Thirteen major AMSA workshops were held from July 2006 through October 2008 on a broad range of relevant topics, including scenarios of future Arctic navigation, indigenous marine use, Arctic marine incidents, environmental impacts, marine infrastructure, Arctic marine technology and the future of the Northern Sea Route and adjacent seas. The AMSA workshops provided extensive information for developing the report sections. The AMSA 2009 Report is focused on current and future Arctic marine activity. The results of this comprehensive assessment are a range of key findings linked to the main topics identified. These findings are listed in full throughout The AMSA 2009 Report at the end of each section. Presented here is a synopsis, or review, of the AMSA findings for each section. Arctic Marine Geography, Climate and Sea Ice: Arctic sea ice has been observed to be decreasing in extent and thickness during the second half of the 20th century and early 21st century. Global Climate Model simulations indicate a continuing retreat of sea ice, but also show that the winter sea ice cover will remain. There is a possibility of an ice-free Arctic Ocean for a short period in summer perhaps as early as 2015. This would mean the disappearance of multi-year ice, as no sea ice would survive the summer melt season. It is highly plausible there will be greater marine access and longer seasons of navigation, except perhaps during winter, but not necessarily less difficult ice conditions for marine operations. History of Arctic Marine Transport: There is a long history of Arctic marine transport conducted primarily around the ice-free periphery of the Arctic Ocean. Year-round navigation has been main- tained since 1978-79 in the ice-covered western regions of the Northern Sea Route (between the port of Dudinka on the Yenisei River and Murmansk). Previous Arctic marine transport studies for the Northern Sea Route, Canadian Arctic, Alaska’s coastal seas and other regions have significant relevance to developing any future regulatory framework for the Arctic Ocean. Most of these past studies involved public-private partnerships and close international cooperation. Governance of Arctic Shipping: The Law of the Sea, as reflected in the United Nations Convention on the Law of the Sea (UNCLOS), provides a fundamental framework for the governance of Arctic marine navigation and allows coastal states the right to adopt and enforce non-discriminatory laws and regulations for the prevention, reduction and control of marine pollution from vessels in ice-covered waters (Article 234). The International Maritime Organization (IMO) is the competent UN agency with responsibility for issues related to the global maritime industry. IMO has been proactive in developing voluntary Guidelines for Ships Operating in Arctic Ice-covered Waters, which continue to evolve. The International Association of Classification Societies (IACS) has also developed non-mandatory Unified Requirements for their members that address ship construction standards of the Polar Classes, which are defined in the IMO Guidelines. There are no uniform, international standards for ice navigators and for Arctic safety and survival for seafarers in polar conditions. And, there are no specifically tailored, mandatory environmental standards developed by IMO for vessels operating in Arctic waters. Mandatory measures, drawn up in accordance with the provisions of customary international law as reflected in UNCLOS, would be an effective way to enhance marine safety and environmental protection in Arctic waters. Expanded Arctic marine traffic increases the possibility of, for example, introducing alien species and pathogens from ballast water discharge and hull fouling. Current Marine Use and the AMSA Shipping Database: There were approximately 6,000 individual vessels, many making multiple voyages, in the Arctic region during the AMSA survey year; half of these were operating on the Great Circle Route in the North Pacific that crosses the Aleutian Islands. Of the 6,000 vessels reported, approximately 1,600 were fishing vessels. Nearly all shipping in the Arctic today is destinational, conducted for community re-supply, marine tourism and moving natural resources out of the Arctic. Regions of high concentrations of Arctic marine activity occur along the coasts of northwest Russia, and in the ice-free waters off Norway, Greenland, Iceland and in the U.S. Arctic. Significant increases in cruise ships, a majority not purpose-built for Arctic waters, have been observed in the summer season around Greenland within the past decade. There have been recent marine operations in the ice-covered central Arctic Ocean for scientific exploration and marine tourism. 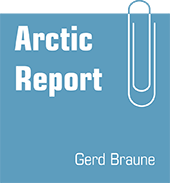 Scenarios, Futures and Regional Futures to 2020: Arctic natural resource development (hydrocarbons, hard minerals and fisheries) and regional trade are the key drivers of future Arctic marine activity. However, there are many other factors and uncertainties of importance including governance, Arctic state cooperation, oil prices, changes in global trade, climate change variability, new resource discoveries, marine insurance industry roles, multiple use conflicts and Arctic marine technologies. Future Arctic marine activity will include many non-Arctic stakeholders, multiple users in Arctic waterways and potential overlap of new operations with indigenous uses. Arctic voyages through 2020 will be overwhelmingly destinational, not trans-Arctic. A lack of major ports, except for those in northern Norway and northwest Russia, and other critical infrastructure will be significant limitations for future Arctic marine operations. The Bering Strait region, ringed with indigenous communities and a highly productive ecosystem with many species of marine mammals, fish and seabirds, may require formally established vessel routing measures. Offshore hydrocarbon developments may lead to increased marine traffic in the Bering Strait region. For the Canadian Arctic, the Northwest Passage is not expected to become a viable trans-Arctic route through 2020, but destinational shipping is anticipated to increase. Marine transportation of oil from the Pechora Sea to Europe is considered technically and economically feasible; the volume of oil and gas may be as high as 40 million tons per year by 2020 on the western Northern Sea Route. Human Dimensions: Marine shipping is one of many factors impacting Arctic communities. There may be some positive economic impacts to increased shipping. However, Arctic residents express concern for the social, cultural and environmental effects of such expansion. The possibility of oil spills is a major concern and hunters are especially concerned about the disruption of marine species and their hunting practices. The costs and benefit of Arctic shipping will likely be unevenly distributed among and within communities and regions. Constructive and early engagement of local residents in planned Arctic marine development projects can help to reduce negative impacts and to increase positive benefits. Importantly, many local Arctic residents today depend heavily on marine resources for subsistence and the local economy; over-the-ice travel and boat transport allow the use of large marine areas during much of the year. Such life in the Arctic is dependent on movement over the ice and ocean and sea ice is integral to this movement. Environmental Considerations and Impacts: The most significant threat from ships to the Arctic marine environment is the release of oil through accidental or illegal discharge. Additional potential impacts of Arctic ships include ship strikes on marine mammals, the introduction of alien species, disruption of migratory patterns of marine mammals and anthropogenic noise produced from marine shipping activity. Changes in Arctic sea ice will not only provide for possible longer seasons of navigation, but may also result in increased interaction between migrating species and ships. Black carbon emissions from ships operating in the Arctic may have regional impacts by accelerating ice melt. Other ship emissions during Arctic voyages, such as SOx and NOx, may have unintended consequences for the Arctic environment and these emissions may require the implementation of additional IMO environmental regulations. Arctic Marine Infrastructure: There is a general lack of marine infrastructure in the Arctic, except for areas along the Norwegian coast and northwest Russia, compared with other marine regions of the world with high concentrations of ship traffic. Gaps in hydrographic data exist for significant portions of primary shipping routes important to support safe navigation. In addition, for safe opera- tions in the Arctic there is a need for the same suite of meteorological and oceanographic data, products and services as in other oceans, plus comprehensive information on sea ice and icebergs. Except in limited areas of the Arctic, there is a lack of emergency response capacity for saving lives and for pollution mitigation. There are serious limitations to radio and satellite communications and few systems to monitor and control the movement of ships in ice-covered waters. The current lack of marine infrastructure in all but a limited number of areas, coupled with the vastness and harshness of the environment, makes conduct of emergency response significantly more difficult in the Arctic. The focus of the AMSA is marine safety and marine environmental protection, which is consistent with the Arctic Council’s mandates of environmental protection and sustainable development. Based on the findings of the AMSA, recommendations were developed to provide a guide for future action by the Arctic Council, Arctic states and many others. The AMSA recommendations are presented under three broad, inter-related themes that are fundamental to understanding the AMSA: Enhancing Arctic Marine Safety, Protecting Arctic People and the Environment, and Building Arctic Marine Infrastructure. It is recognized that implementation of these recommendations could come from the Arctic states, industry and/or public-private partnerships. A. Linking with International Organizations: That the Arctic states decide to, on a case by case basis, identify areas of common interest and develop unified positions and approaches with respect to international organizations such as: the International Maritime Organization (IMO), the International Hydrographic Organization (IHO), the World Meteorological Organization (WMO) and the International Maritime Satellite Organization (IMSO) to advance the safety of Arctic marine shipping; and encourage meetings, as appropriate, of member state national maritime safety organizations to coordinate, harmonize and enhance the implementation of the Arctic maritime regulatory framework. ---Drawing from IMO instruments, in particular the Arctic Guidelines, augment global IMO ship safety and pollution prevention conventions with specific mandatory requirements or other provisions for ship construction, design, equipment, crewing, training and operations, aimed at safety and protection of the Arctic environment. C. Uniformity of Arctic Shipping Governance: That the Arctic states should explore the possible harmonization of Arctic marine shipping regulatory regimes within their own jurisdiction and uniform Arctic safety and environmental protection regulatory regimes, consistent with UNCLOS, that could provide a basis for protection measures in regions of the central Arctic Ocean beyond coastal state jurisdiction for consideration by the IMO. That the Arctic states should support the application of the IMO’s Enhanced Contingency Planning Guidance for Passenger Ships Operating in Areas Remote from SAR Facilities, given the extreme challenges associated with rescue operations in the remote and cold Arctic region; and strongly encourage cruise ship operators to develop, implement and share their own best practices for operating in such conditions, including consideration of measures such as timing voyages so that other ships are within rescue distance in case of emergency. E. Arctic Search and Rescue (SAR) Instrument: That the Arctic states decide to support developing and implementing a comprehensive, multi-national Arctic Search and Rescue (SAR) instrument, including aeronautical and maritime SAR, among the eight Arctic nations and, if appropriate, with other interested parties in recognition of the remoteness and limited resources in the region. A. Survey of Arctic Indigenous Marine Use: That the Arctic states should consider conducting surveys on Arctic marine use by indigenous communities where gaps are identified to collect information for establishing up-to-date baseline data to assess the impacts from Arctic shipping activities. B. Engagement with Arctic Communities: That the Arctic states decide to determine if effective communication mechanisms exist to ensure engagement of their Arctic coastal communities and, where there are none, to develop their own mechanisms to engage and coordinate with the shipping industry, relevant economic activities and Arctic communities (in particular during the planning phase of a new marine activity) to increase benefits and help reduce the impacts from shipping. C. Areas of Heightened Ecological and Cultural Significance: That the Arctic states should identify areas of heightened ecological and cultural significance in light of changing climate conditions and increasing multiple marine use and, where appropriate, should encourage implementation of measures to protect these areas from the impacts of Arctic marine shipping, in coordination with all stakeholders and consistent with international law. D. Specially Designated Arctic Marine Areas: That the Arctic states should, taking into account the special characteristics of the Arctic marine environment, explore the need for internationally designated areas for the purpose of environmental protection in regions of the Arctic Ocean. This could be done through the use of appropriate tools, such as “Special Areas” or Particularly Sensitive Sea Areas (PSSA) designation through the IMO and consistent with the existing international legal framework in the Arctic. E. Protection from Invasive Species: That the Arctic states should consider ratification of the IMO International Convention for the Control and Management of Ships Ballast Water and Sediments, as soon as practical. Arctic states should also assess the risk of introducing invasive species through ballast water and other means so that adequate prevention measures can be implemented in waters under their jurisdiction. F. Oil Spill Prevention: That the Arctic states decide to enhance the mutual cooperation in the field of oil spill prevention and, in collaboration with industry, support research and technology transfer to prevent release of oil into Arctic waters, since prevention of oil spills is the highest priority in the Arctic for environmental protection. G. Addressing Impacts on Marine Mammals: That the Arctic states decide to engage with relevant international organizations to further assess the effects on marine mammals due to ship noise, disturbance and strikes in Arctic waters; and consider, where needed, to work with the IMO in developing and implementing mitigation strategies. H. Reducing Air Emissions: That the Arctic states decide to support the development of improved practices and innovative technologies for ships in port and at sea to help reduce current and future emissions of greenhouse gases (GHGs), Nitrogen Oxides (NOx), Sulfur Oxides (SOx) and Particulate Matter (PM), taking into account the relevant IMO regulations. A. Addressing the Infrastructure Deficit: That the Arctic states should recognize that improvements in Arctic marine infrastructure are needed to enhance safety and environmental protection in support of sustainable development. Examples of infrastructure where critical improvements are needed include: ice navigation training; navigational charts; communications systems; port services, including reception facilities for ship-generated waste; accurate and timely ice information (ice centers); places of refuge; and icebreakers to assist in response. B. Arctic Marine Traffic System: That the Arctic states should support continued development of a comprehensive Arctic marine traffic awareness system to improve monitoring and tracking of marine activity, to enhance data sharing in near real-time, and to augment vessel management service in order to reduce the risk of incidents, facilitate response and provide awareness of potential user conflict. The Arctic states should encourage shipping companies to cooperate in the improvement and development of national monitoring systems. C. Circumpolar Environmental Response Capacity: That the Arctic states decide to continue to develop circumpolar environmental pollution response capabilities that are critical to protecting the unique Arctic ecosystem. This can be accomplished, for example, through circumpolar cooperation and agreement(s), as well as regional bilateral capacity agreements. D. Investing in Hydrographic, Meteorological and Oceanographic Data: That the Arctic states should significantly improve, where appropriate, the level of and access to data and information in support of safe navigation and voyage planning in Arctic waters. This would entail increased efforts for: hydrographic surveys to bring Arctic navigation charts up to a level acceptable to support current and future safe navigation; and systems to support real time acquisition, analysis and transfer of meteorological, oceanographic, sea ice and iceberg information.